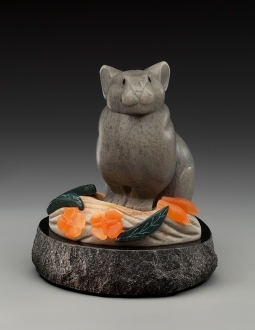 “Alpine Harvest,” the little pika and his haystack of wild flowers, was juried into the Society of Animal Artists’ 55th Annual Exhibition on Art and the Animal. The show premieres at the Roger Tory Petersen Institute in Jamestown, New York. It runs from August 28 and through October 25, 2015. There are so many great artists in the SAA that the annual show is always very competitive. I am thrilled to have my sculpture included in this year’s show. Only a small percentage of the artwork chosen by the jury is sculpture, and only a small portion of that is stone sculpture. This will be the third appearance of my work with this prestigious group. “White Lightning” was included in the show in 2012, and “At Home with the Water Shrew” was selected in 2013. My work is one-of-a-kind and I am so pleased when a sculpture is shown in a national venue where many people will be able to see it before it is sold. The design for “Alpine Harvest” rides the ascending spiral of sculptures I make using multiple colored stones. Three alabasters and two marbles were used to create this engaging piece. Carving and engineering on these separate forms is challenging in a really fun way. The result (for me) is worth all the effort. Finger dexterity is everything when making small blossoms and leaves. I credit my two decades of flipping animation drawings with providing all ten fingers the skills needed to hold and shape these small elements. I am still discovering ways in which my years at Disney influence and contribute to my stone sculpture. May it always be that way!